The heavily migrant-populated Stockholm suburb of Rinkeby in Sweden is often cited as a textbook example of a No-Go Zone where police are constantly under threat of attack from residents. To deal with the danger, the police have planned a new fortified police station. But police are at such risk it may not safe for them to take public transport to work, Mitti.se reports. The new station in Rinkeby will cost 380 million Swedish Krona (£35 million) to build. It will look like and be designed as a fortress with bullet proof windows, steel reinforced walls, and surrounded by security fence. Security is the police’s main concern in the area following attacks against them by residents while out on patrol. Police in Rinkeby rarely venture on foot into the area without backup. Göran Strömberg, acting head of the police force’s national local planning, said: “The new police building will be a protected and have the same type of security as police stations in similar areas like Rosengård and Södertälje.” Rosengård, a migrant-populated suburb in the southern city of Malmö, is notorious for its gang crime and grenade attacks. Christoffer Ersenius, local union president of the police district of Rinkeby, said many officers who police the area are still afraid for their safety. “There is concern among the staff about working in a police station in Rinkeby. We understand this concern, especially when it is about how to safely travel to and from their workplace in Rinkeby,” he said adding that many who work in the police would be recognised by locals. There are also safety concerns for those contracted to build the new police station. Earlier this month, it was revealed that the police had put the project on hold as contractors were reluctant to take on the work for fear of their workers’ safety. Dramatic footage also emerged weeks ago that showed how police in Rinkeby are treated by locals. The footage, which is said to come from 2015, shows youths attacking police and telling them they have no authority in the troubled neighbourhood. 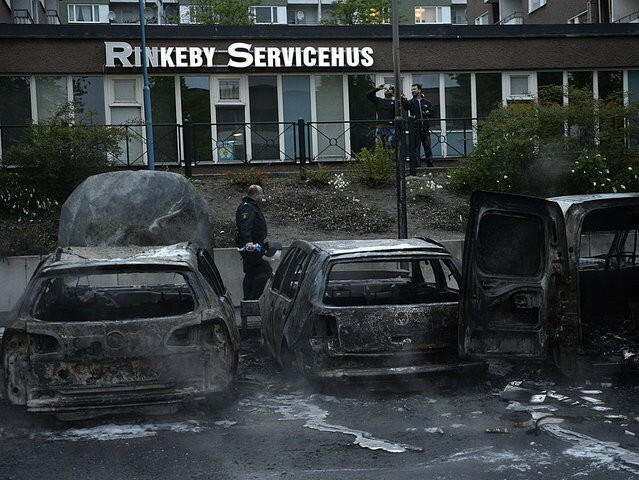 Rinkeby was also the site of a riot which saw looting and car burnings less than 48 hours after U.S. President Donald J. Trump mentioned the impact of mass migration on Sweden.